It began when I was in high school... well maybe it began before then, as I have always been an early bird. When I was in grade school I would be the first one up in the house. It was always so quiet and dark and cold in the winter. I would go behind the couch with a blanket and sit right next to the heating vent on the floor, trapping all the heat with the blanket. I lay behind the couch not only to be warm but also to hide as I was afraid I would get in trouble for being up that early. I have no idea why I had that fear, just one of those funny irrational childhood fears. My Freshmen year of high school my brother was a Senior, which meant he could drive and I didn't have to take the bus. Before school we had early morning seminary, a bible and scripture study class, at 6:00 A.M. It was not easy getting up in time for this, especially for my brother. Every morning as 6:00 AM approached I remember pestering him, reminding him, pleading for him to hurry so we could leave. Finally about 6:20 or so we would pull into the driveway of the house seminary was at. Then somehow, even though we were twenty minutes late, he somehow was often still not ready and would need to stop home for one more thing. The long drive to school on the one-lane road that was always so backed up seemed horribly slow. The time definitely seemed to tick faster than the distance we covered and my anxiety increased with it. Thankfully my first period teacher was very forgiving and didn't mark tardy on the days I ran in late. Somehow I survived that year, but now still to this date if the clock seems to be ticking more quickly than we are moving, flashbacks of my Freshmen year rush back. 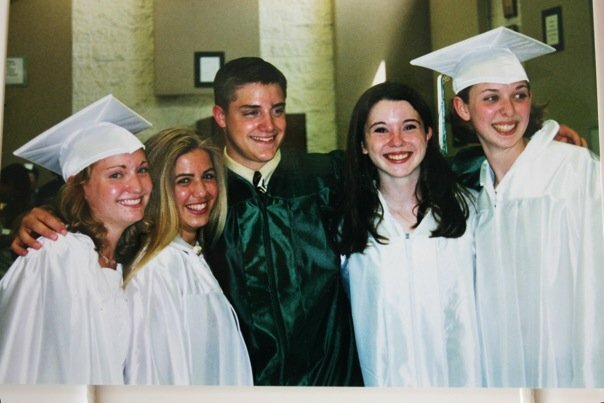 For fun- a little flash back to graduation my Senior year. Are you an early person or always fashionably late? I used to be fashionably late, as in I was often hours late for things. It drove my friends nuts but they still loved me ha ha. Now I cannot stand to even show up on time. I have to be at least ten to fifteen minutes early or I start feeling anxious.